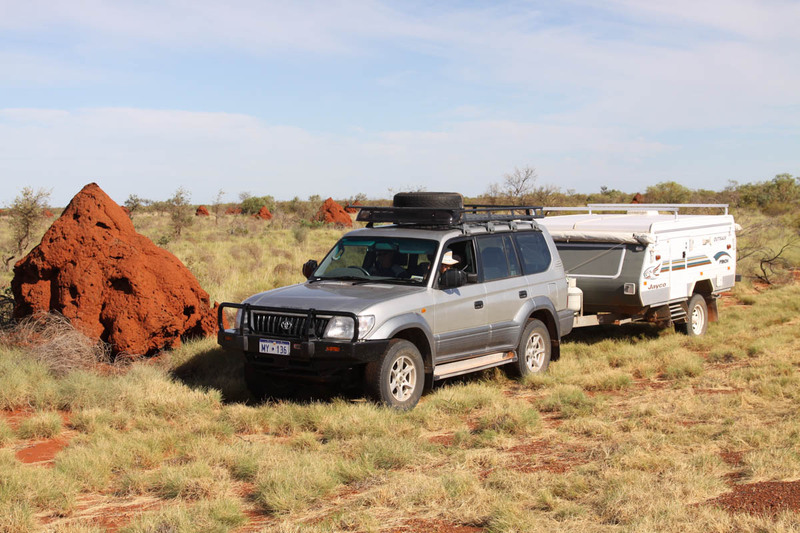 Caravanning the Top End? 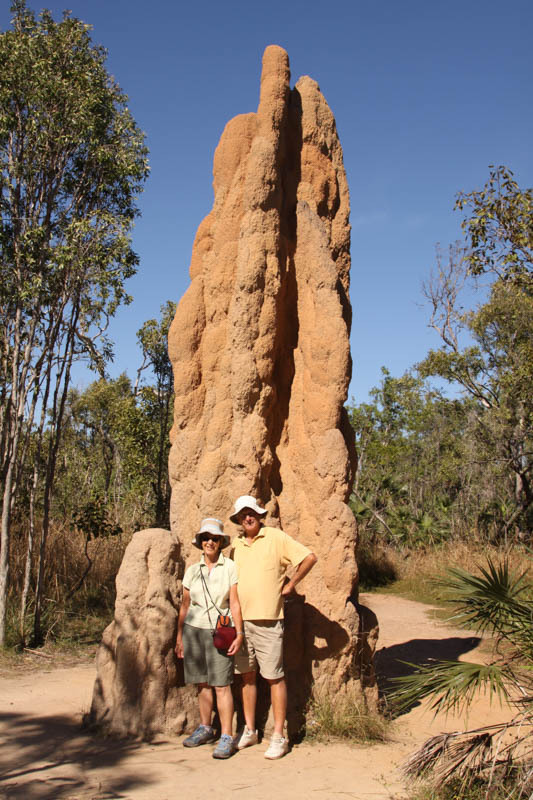 Be on the lookout for termite mounds, a fascinating outback icon. 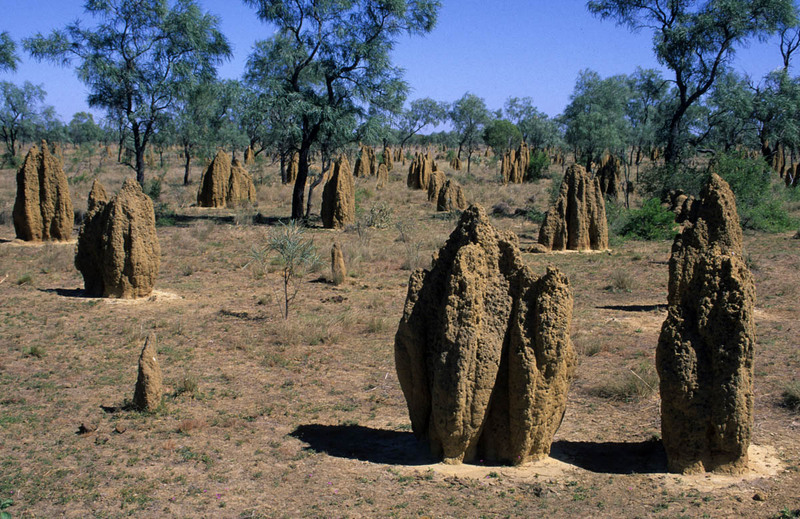 Right across northern Australia are millions of termite mounds. They are everywhere, and each year thousands more spring up in all shapes and sizes – no council approvals, stamp duty or rigid building regulations up here. In fact, every mound is different, each one individually designed and built, and for the building teams there are no strikes, sickies or weekends. They simply work non-stop, seven days a week. World-wide, there are around 2000 different species of termites, of which 350 are in Australia but only 20 of these are destructive. 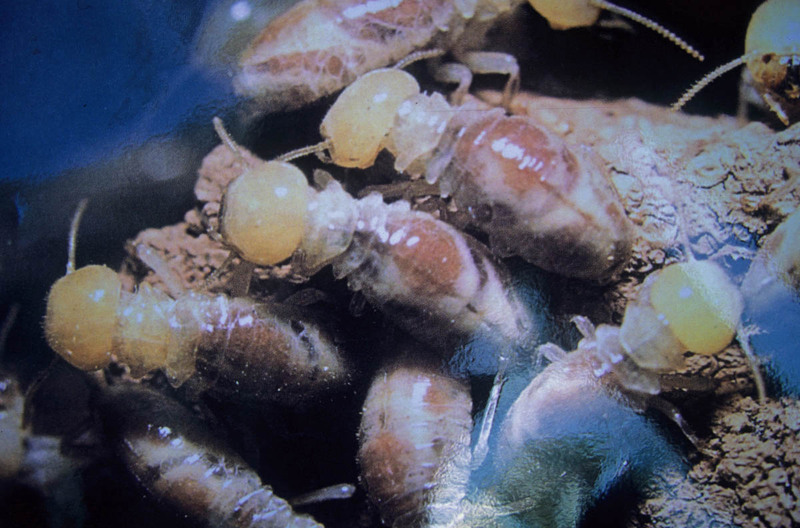 Termites live in large social colonies comprising kings, queens, workers and soldiers. They are generally large, whitish or brown in colour, soft-bodied, avoid sunlight and build large clay mounds called termitariums that can sometimes also be found on rock faces or engulfing parts of trees and stumps. The outer crust of their homes, which can be active for 100 years or more, is very hard, as has been found by outback travellers who have driven into one. Many vehicles have been totally written off after high-speed clashes with these formidable obstacles. 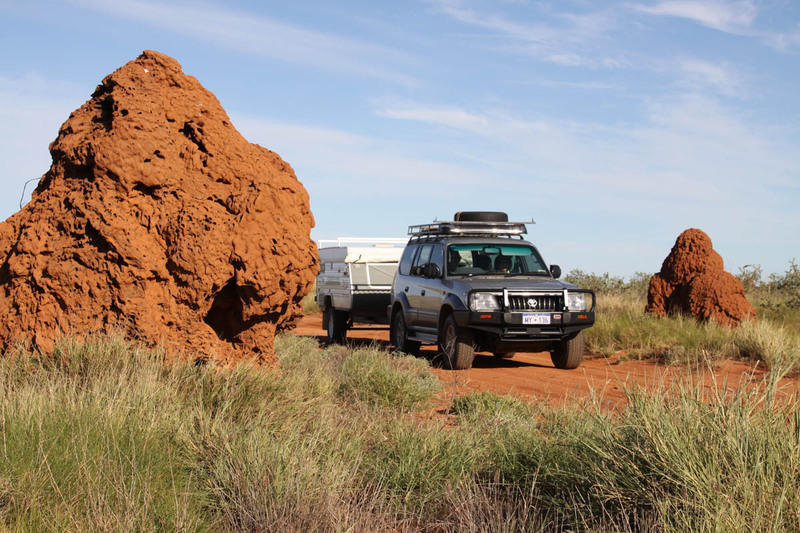 Termite mounds are evidence of hundreds of millions – billions – of termites that have spent their entire lives building over huge tracts of land in our remote tropical outback. The inner chambers of their mounds are made up of complex tunnels, inter-connecting galleries and nest chambers. The mounds are built from soil, saliva and excreta, and this combination accounts for the different coloured mounds found in various areas of the north. 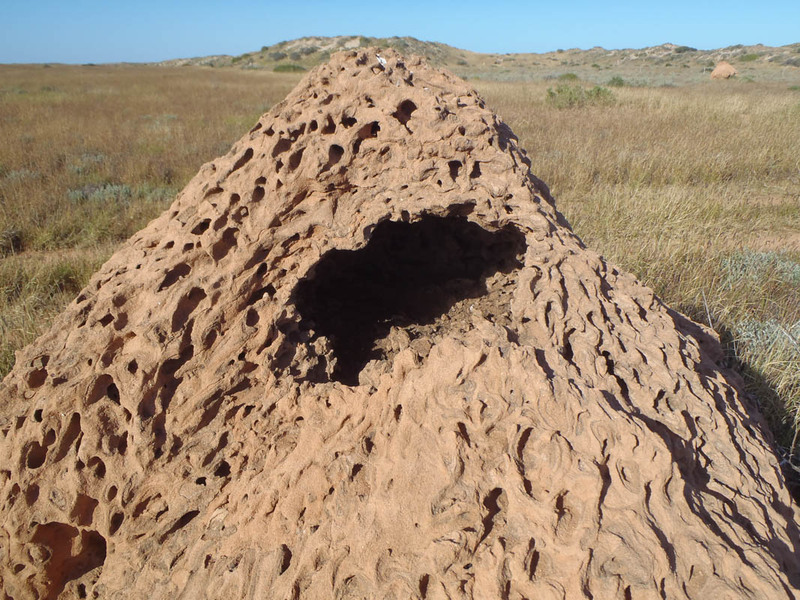 The living quarters of a termite mound are like a nerve centre, with a network of tunnels, some over 50 metres long, branching out to a dozen or more trees and other food sources in the vicinity. The network, in many instances, can cover up to a hectare. While the north boasts quite a few different species of Australia’s termites, the predominant and quite distinctive mounds seen scattered across thousands of kilometres reveal that the grass-eating spinifex termites and the almost legendary magnetic termites are the main little creatures hard at work up here. 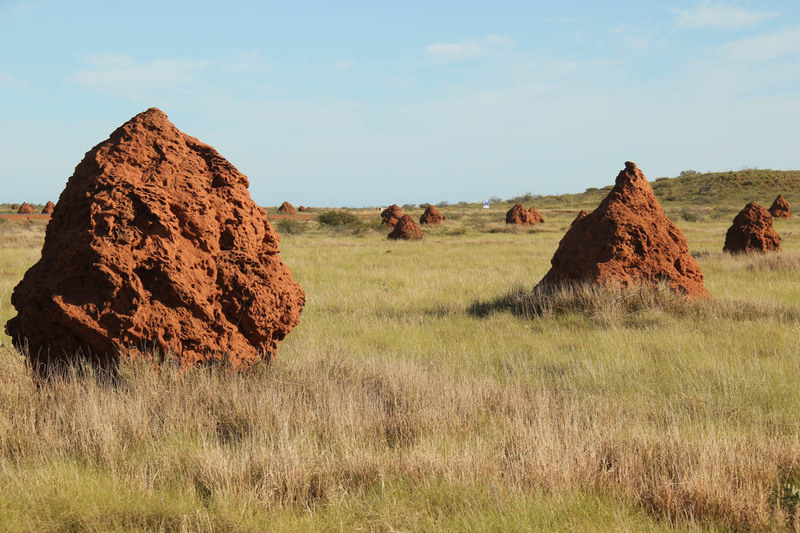 The grass-eating spinifex termites found right across northern Australia, from the north-west of WA to Cape York, are the builders of the largest termite mounds found in the country. Some are reported to be around seven metres high and weighing 10 or more tonnes each. 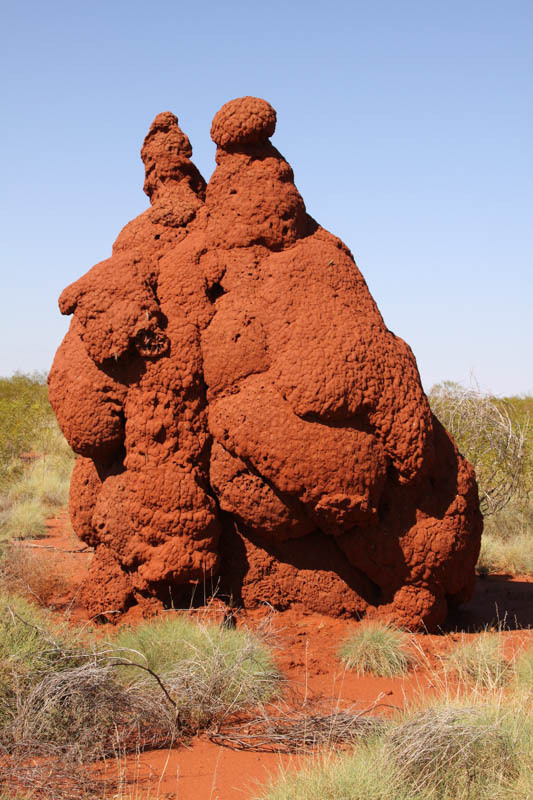 The shape of the spinifex termite mounds vary from one area to another. They are generally conical, some in cathedral-like shapes, and are often seen standing tall over vast areas. The so-called magnetic termites, meanwhile, were once thought to build their high, narrow mounds, which have knife-like edges, in a north-south axis to line up with the earth’s magnetic field. Research, however, has revealed that this was not entirely true, as these cunning little creatures actually build their homes according to the passage of the sun, so that it never shines squarely and directly on the broad surface of their mounds. These mounds are often seen in clusters of several hundred, resembling large cemeteries, each ‘headstone’ aligned in the same direction. 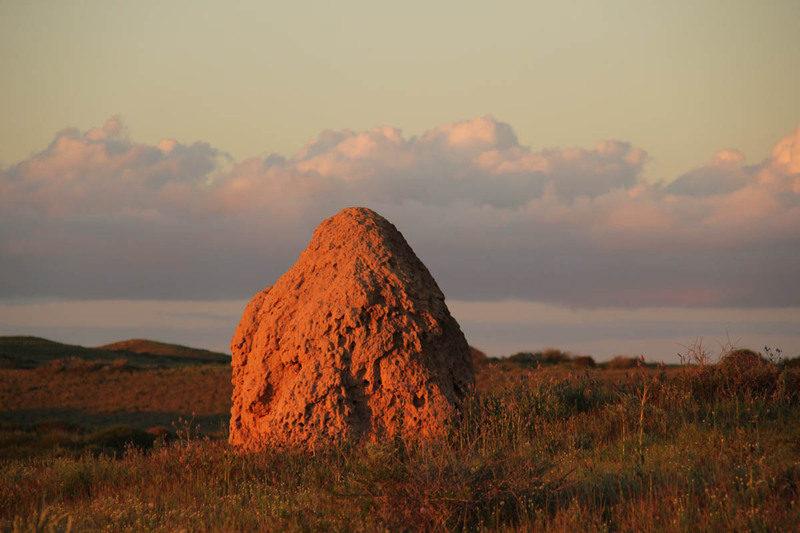 As well as hosting their millions of residents, termite mounds are often also inhabited by a variety of others: geckoes, lizards, pythons, ants and spiders, and even birds, like the kingfishers and other species found nesting in excavated outer walls and crevices in the mounds. The golden-shouldered parrot actually tunnels into hollow nest chambers deep inside termite mounds to make its nest. The termites respond by simply sealing off the damaged section of the mound, leaving their tunnels and chambers with a smooth, solid inside wall surface. Over the years, these birds and other creatures have not been the only intruders the termites have had to put up with. Early explorers and stockmen found special qualities in the mounds. They hollowed out many of them to make very efficient ovens. These pioneers would dig out a large opening at ground level and a much smaller one high up on the opposite side of the mound to serve as a chimney. Over the years, the charred bones of small animals cooked in these primitive, but effective, bush ovens, have been found. Going back even further, it is known that as part of their funeral rituals, early Aborigines in the Kimberley would sometimes inter their deceased in holes dug out of active termite mounds. Within a short time, the termites would reseal the entrance to the cavity that was created to accommodate the remains – like the closing of the lid of a tomb! It is understandable, therefore, that in this region termite mounds are usually treated by Aboriginal people with reverence. 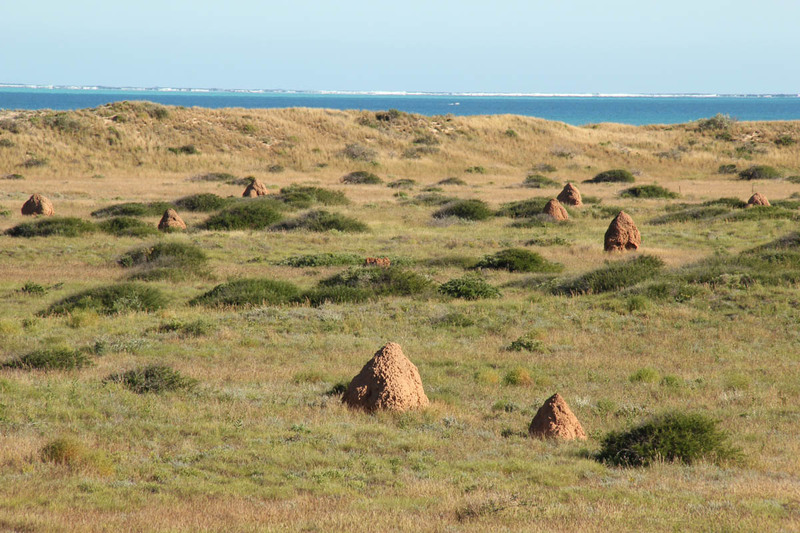 With such vast areas of our tropical north dotted with millions of these termite cities, travellers in these parts can only admire the tenacity and building achievements of these little critters, particularly in such remote and harsh conditions.